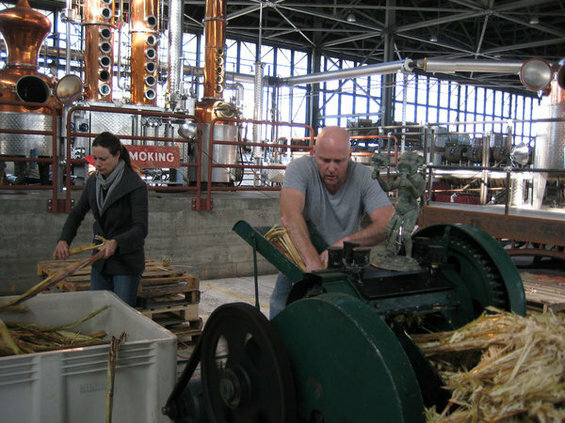 Photo: Lou Bustamante St. George Spirits' Lance Winters, crushing sugarcane at the Alameda distillery. Rum is a spirit that arrives in the glass with stories and images built in: tales of pirates, deserted islands, buried treasure, and tropical fields lush with sugarcane. Since rum has been the lifeblood of seafarers, it’s fitting that a port city like ours would require not one, but two rum houses: Smuggler’s Cove and Bar Agricole. S.F.’s ardor has encouraged local production as well. Charbay in Napa has produced lovely unaged and vanilla infused expressions for some time, and now Alameda’s St. George Spirits is releasing what could be the first U.S. agricole-style rum, Agua Libre.